"Lured! to the house of monsters." "Guaranteed to FRIGHTEN!" John Carradine is a mad scientist convinced he has the key to eternal life, namely a gland transplant. It turns his test subjects into mutants, but you know what they say about omelets and eggs, right? With shorts Posture Pals and Appreciating Our Parents. The first short has kids learning about posture in school and bying to become Posture Royalty. The second is an oppressive piece devoted to killing any joy and spontaneity a kid might have in the name of parental obedience. The movie's kind of a slog (even though it contains our first exposure to Tor Johnson! ), but the shorts are both iconic, and the host segments are pretty good. YouTube (1h37m) Premiered December 14, 1991. "Mad doctor uses patients at his isolated psychiatric institute as subjects in his attempts to create longevity by surgically installing an artificial gland in their skulls, with disastrous results." Directed by Boris Petroff. Written by Jane Mann and John D.F. Black. Starring John Carradine, Myron Healey and Allison Hayes, with Tor Johnson. Same deal for our weekly showing, today (Thursday) at 9 PM Eastern time, at http://sync-video.com/tv/rodneylives. 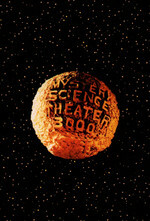 MST3K Club show FAQ here. Last week I added rather more drive-in theater intermission reels to the playlist, so get ready for new cut-rate snack bar sales cartoons! Next week. Ooooh next week. 321: SANTA CLAUS CONQUERS THE MARTIANS.